CANTON, Mass. – With 50 seconds left in regulation, Scituate’s goalie made his first save of the night and the Sailors, who led only once, had the opportunity to win the game. Canton LSM Brendan Albert’s stick check knocked the ball loose as the clock wound down and he managed to flick the ball backwards off the sideline to be scooped up by Matt Martin. That defensive stand forced overtime in Monday night’s Div. 2 South showdown at World War II Veterans Memorial Field, but the Bulldogs would need another stop if they wanted to have a chance at the win. Canton held on defensively for more than two minutes before snatching possession. Following a timeout, the Bulldogs put the ball in the stick of junior attacker Griffin Roach behind the cage with classmate Mike Shaw setting a screen to give Roach a step of space. That was all he would need. 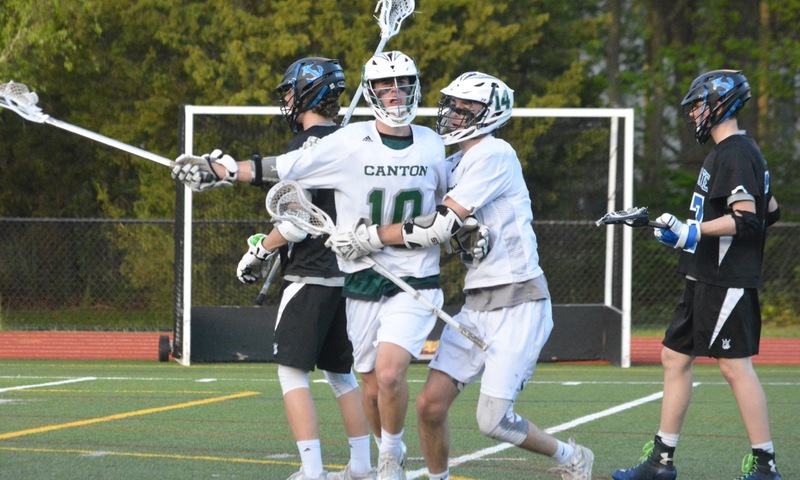 He drove towards the alley and spun back on his defender towards the goal and finished in traffic to lift Canton to an 11-10 victory. It has been a difficult stretch of the season for the Bulldogs, who lost to division rival North Attleboro by two and Sharon by one. It was also the second straight overtime game for Canton, which lost to King Philip last time out in a game that was a mirror image of Monday night. Scoring was at a premium in the first half. Dan Cohen got the night started with a man-up goal off a Kevin Albert assist, ripping a shot from straightaway. Scituate scored 90 seconds later to tie it, but Canton regained the lead with six minutes left in the first. Charlie O’Connor raced straight off the bench and down the middle where he received a pass from David Allen and held it until finishing on the edge of the crease. The Sailors tied it again three minutes into the second, but Roach scored his first of the night with a drive to the cage from the right side, spinning past his marker and flicking a shot over the goalie. Scituate hit the post and Canton missed a chance off a turnover when Kevin Albert’s pass sailed over Shaw’s stick. Cohen opened the scoring in the second half to build a two-goal lead, but Scituate answered back with three straight goals to take its first and only lead of the night at 5-4. Sophomore Jack Connolly made a big save and outlet pass to Cohen for a transition goal that tied the game and stole back momentum. Connolly finished the game with 16 saves. Cohen added an assist on a man-up situation a minute later with a perfect skip pass to Shaw on the left wing and the attacker patiently picked the near post corner to make it 6-5. Nick MacKay forced a turnover at midfield with a minute left in the third and ran around in the offensive half trying to use up the rest of the clock, but then the long pole dodged past his tired marker and scored with three seconds left in the third. The teams traded goals to start the fourth quarter, with Cohen scoring his fourth of the night. Scituate then scored two in a row to even the score at 8-8. Allen struck the post with a rocket of a shot, but the carom went right to a teammate, Kevin Albert, who found the back of the net with a lefty shot on the run. Again, Scituate tied the game and had the chance at the lead but Connolly made one of his four fourth quarter saves. Albert was again the player to step up and put the Bulldogs in front with a similar effort to his first goal. “When things were stalling is when Kevin said, I need to make a play and he scored a couple of big goals,” said Bendell. Canton (4-5, 6-6) will be back home on Wednesday against Taunton, now needing two wins in the final four games to seal a tournament berth. King Philip @ Oliver Ames – Postponed to Tuesday, 5/22 at 3:45. Oliver Ames @ King Philip – Postponed to a time and date to be determined. Canton, 3 @ Natick, 10 – Final – Canton trailed by just two (4-2) at halftime but were done in by penalties in the second half. Mike Shaw, Charlie O’Connor, and Dan Cohen each scored for the Bulldogs. 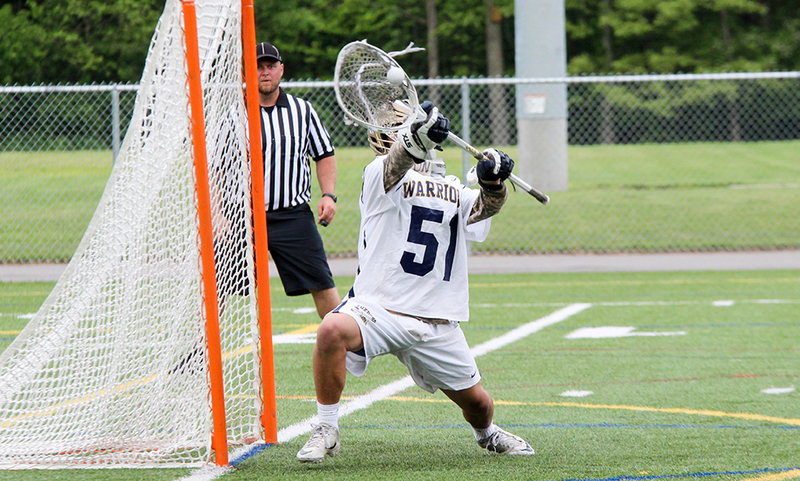 Foxboro, 10 vs. Scituate, 4 – Final – After a back-and-forth first half that saw Foxboro take a one-goal lead (5-4), the Warriors pitched a shutout in the second half to beat Scituate and advance to the finals of the Chowda Cup to take on Catholic Memorial. Bobby Yerardi had three goals for Foxboro while Brendan Tully and Louis Piccolo each scored twice. Jake Addeche made seven saves in net. Franklin, 13 vs. Lexington, 5 – Final – Franklin turned a close game into a comfortable win with a dominating fourth quarter. The Panthers led by just two goals, 6-4, after three quarters but scored six unanswered goals during the final frame to get the victory. Head coach Lou Verrochi said Jacob Alexander was unbelievable at the faceoff X, winning 19-of-22 attempts. Jake Davis and Eric Civetti recorded hat tricks and added an assist, Chase Tanner netted three goals, and Nitin Chaudhury chipped in with two tallies. Connor O’Rourke made seven saves in the win. Milford vs. Bellingham – Postponed to a time and date to be determined. Mansfield vs. Natick – Postponed to a time and date to be determined. North Attleboro vs. Walpole – Postponed to a time and date to be determined. Sharon @ North Attleboro – Postponed to a time and date to be determined. King Philip @ Oliver Ames – Postponed to Tuesday, 4/24 at 3:45. North Attleboro @ Sharon – Postponed to a time and date to be determined. Milford, 3 vs. Brockton, 1 – Final – Juniors Joao Boaventura, Josh Orellana, and Zach Browne all notched double-digit kills as the Hawks defended home court against the Boxers with a 3-1 (25-13, 13-25, 25-23, 25-23) win. Boaventura had a team-high 14 kills, 15 digs, and two blocks while Orellana added 13 kills and Browne finished with 10 kills.